Successful composing and improvising stems as much from the right attitude as it is does from applying knowledge. In the previous article, I shared some musical improvisation tips for those interested in experimenting with creative musical expression. If you typically rely on written scores, I suggested starting your experiment by improvising various endings to a familiar song. However, those techniques may not work well at all if you don’t approach the activities with the right attitude. The guidelines below can be extremely helpful in freeing your creative musical self to start behaving like a composer. Again, it all starts with giving yourself permission to be creative, just like all great composers of the past have done. As you read each guideline you might want to consider how it will affect your approach for a specific creative task, such as improvising a new ending for a song. Recognize that nothing is sacred. Once you decide that it’s ok to depart from the composer’s score, whether it’s Beethoven or Jim Brickman or a jazz transcription, you free yourself to the world of creative musical expression. Consider the score in front of you as your inspiration. Creativity takes time. Accept that you may try twenty or thirty ideas before arriving at something you really like or seems truly unique. This doesn’t happen in two minutes! Sometimes musicians experience the thrill of an idea suddenly popping up in their mind, but often that occurs after they have spent time playing and tinkering and rehearsing. Which leads me to my next guideline…. Be playful. Go ahead and let yourself get a little silly. Or random. Or “off the wall”. Try out wacky ideas, or crazy combinations. The outcome may really surprise you! Yes, musicians can be really serious sometimes but remember that playfulness contributes to creativity. Flow first, judge later. Although you may think your inner critic is the secret to your success, constantly finding flaws in your ideas could stop the flow of ideas altogether. You can be picky later, but first you need to get out all the ideas you can, whether they are from your own head or inspired by other things and people. Dig deep. Most likely, the golden nugget you seek (my metaphor for an amazing musical idea) is not going to be your first idea. You might have to discover it, uncover it, or even recover it. Think of tunneling down a winding passage way in search of gold. You will get dirty, sweaty and tired. Yes, my friend: this is work. There are no “mistakes”. For this activity you are in a workshop, not a concert. As you try different variations, some will work and some won’t. It’s no big deal. Learning what not to do is a valuable part of the process. Trust yourself. With time, effort and an attitude that welcomes the creative process, you will be able to craft a new idea that is fits the task at hand. Believe you are creative, because you are. Who should learn to play music? Do only the musically gifted deserve the opportunity to learn music and play publicly? Some music teachers conduct evaluations before accepting students, even at the elementary level. If the goal is to produce performers, then this makes sense. But for most people who study music, in the long run, the benefit will be mainly personal: playing for friends or self, or maybe in a local band. And studies have shown that there are both cognitive and emotional effects to playing music, so that tells me that everyone should have the chance learn how to express themselves through music. Remove the goal of performing publicly or professionally—at least initially. Concentrate on enabling musical expression. 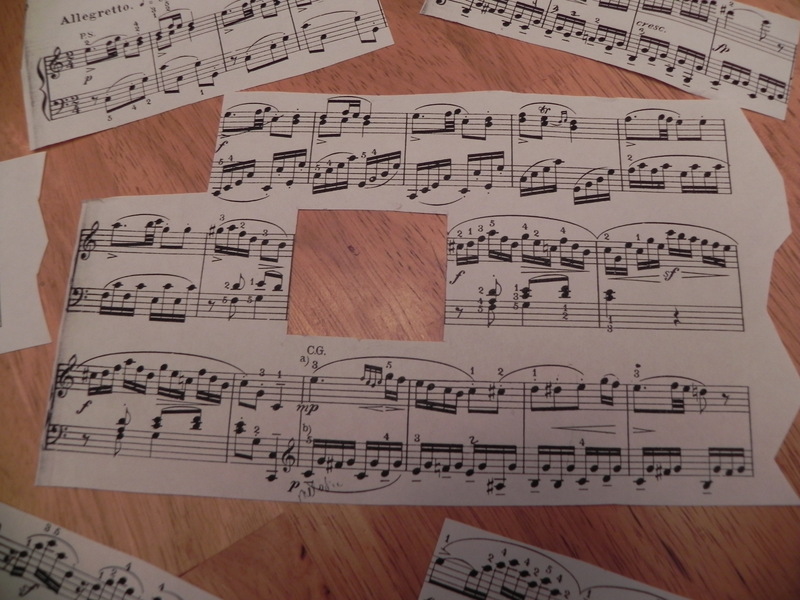 Even beginners can improvise after learning just a few notes and rhythm patterns. One of my favorite first activities with students is something I call “The One-Note Blues”: I provide the chord changes and they improvise on a single note that I assign. It helps students see how much can be done just with rhythm and attitude! Of course gaining knowledge and skill is important—it certainly gives players more options as they create music. But depth of knowledge and refined skill is not a prerequisite to enjoying creative musical expression, even in the first days of learning. Look for the video featuring the one-note blues in the weeks ahead! “The Child’s Right to the Expressive Arts: Nurturing the Imagination as Well as the Intellect”. Position paper of the Association for Childhood Education International, by Mary Rench Jalongo, Professor of Education, Indiana University of Pennsylvania, Indiana. 1990. One afternoon, I heard music coming from the living room. Who could be playing that funky tune? I grabbed my video camera and snuck down the stairs. I was thrilled to find my son totally immersed in improvisation. What inspired him I don’t know, but maybe he just wandered into the living room, saw the Yamaha Motif digital piano, and decided to “go for a spin”. I also don’t know how he came up with that cool riff, but clearly he was onto something that mesmerized him and he just played it over and over. I think what is captured by this video is something that many people wish to experience for themselves: being lost in a creative, musical moment. 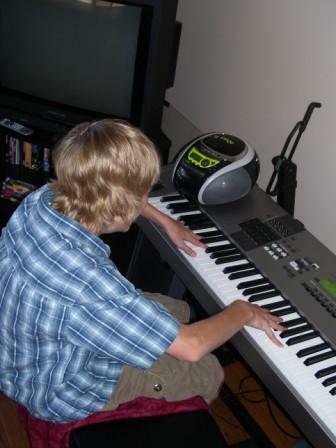 What made this moment possible was allowing my son to have access to my digital piano. Easy access to a musical instrument is one part of opening the door to creative musical expression. Imagine if you wanted to learn to play the electronic keyboard, but every time inspiration struck you had to pull it out from under the bed, carry it over to a table top, plug it in, find a chair the right height (or not)… in most cases, these steps get in the way of playing. Another factor that inhibits musical creativity and learning is keeping an instrument in a location that is uninviting. I have met families who kept their piano in the garage, the basement, or even on a back patio. Not surprisingly, the pianos were always out of tune because of frequent changes in temperature and humidity. But it was also inconvenience, musty odors and lack of ambience that kept the kids from being drawn to play those pianos . Parents who want to encourage a child to play don’t need to have a big house with a music room, but they do need to designate a special place for the instrument. The more visible, the better! Even a living room corner or child’s bedroom can work. My nieces could barely walk by the piano in their living room without stopping to play something. These practice sessions, consisting of just 30 seconds at times, probably added up to an extra hour by the end of the week. Having a special place for music is equally important for adults. Most adults have such busy lives that they might only have a few minutes at a time sit down and play. Seeing that instrument propped in the corner, waiting for you to come and create something special, might be the lure you need to stay consistent. So if you want to be begin creating some special moments with music, begin by designating a place for your instrument. You may also want to setup a place for keeping your learning materials such as music books, pencils, notebook, speakers for listening to songs, headphones, and perhaps a metronome. This is a place for you to build positive associations between learning and music. One of my adult students, when planning her special area for music, included aromatherapy candles, special artwork, and décor that made her feel creative. I welcome your comments and questions, and am especially interested in hearing about how you are making room for music in your life.